My good friend Glen Vokac stopped by to go over several steps in the wing building process. Mainly to help me set up my countersink cages that I will be using right off the start. 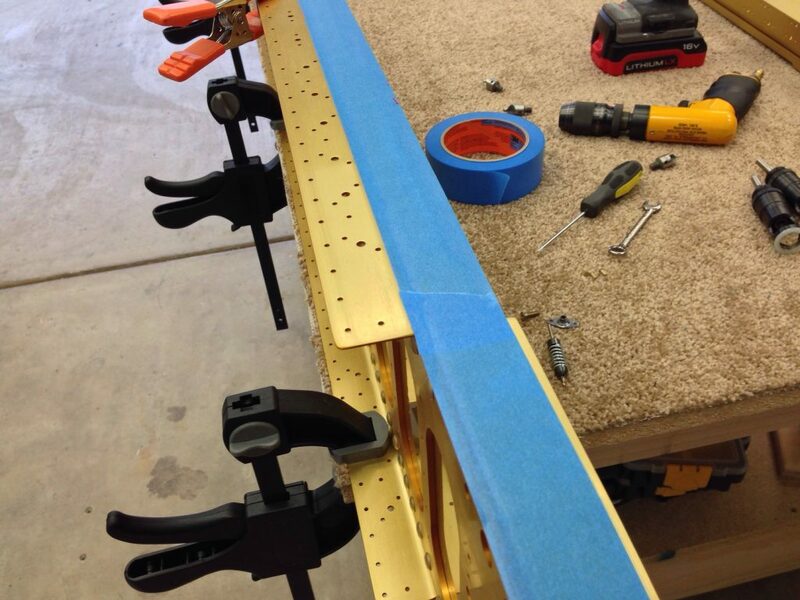 I wanted some extra eyes and help with this step as it is work on the main wing spars. These are big and expensive so making a mistake here would be costly. We did a lot of talking and setting up of the tools. So the time has come to start making some progress! First task is to prep for the many nut plates that go on the spars. 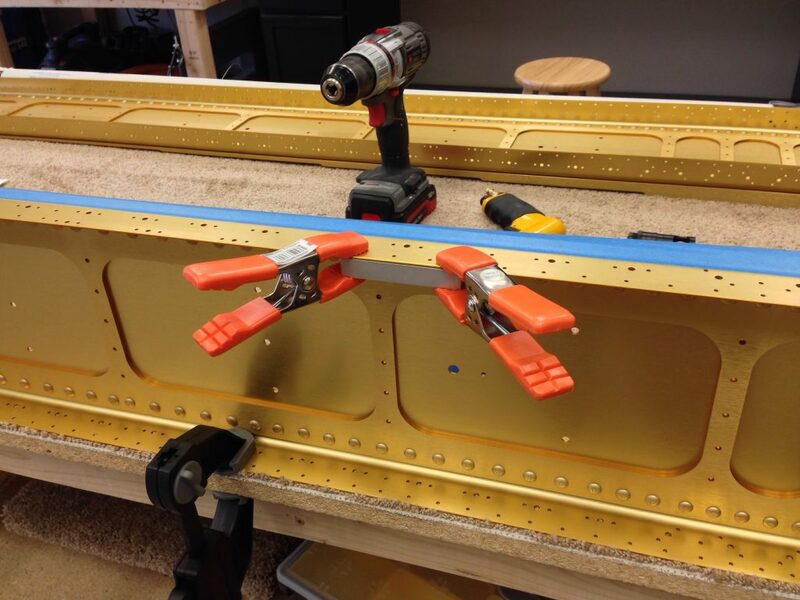 These nut plates will hold the fuel tank skin to the spar and the inspection plates on the bottom of the wing. 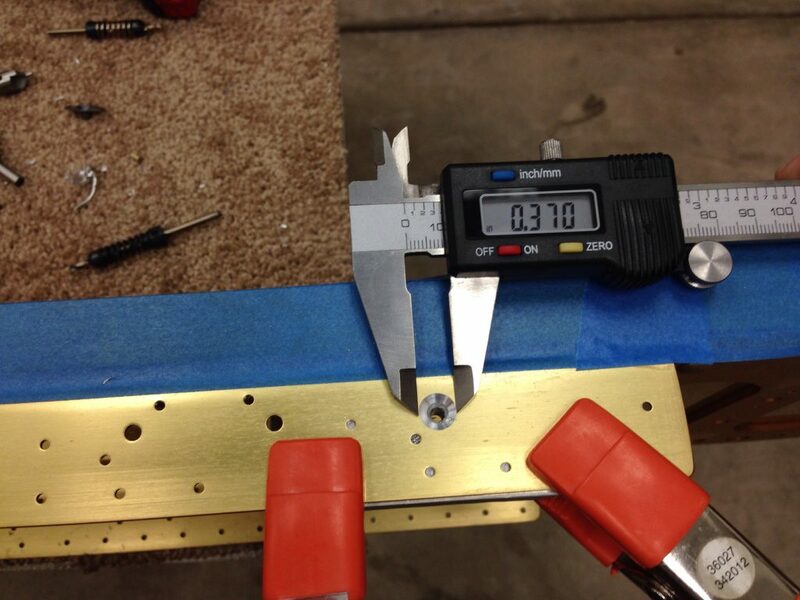 Each nut plat will get two AN426 rivets to hold it to the spar. 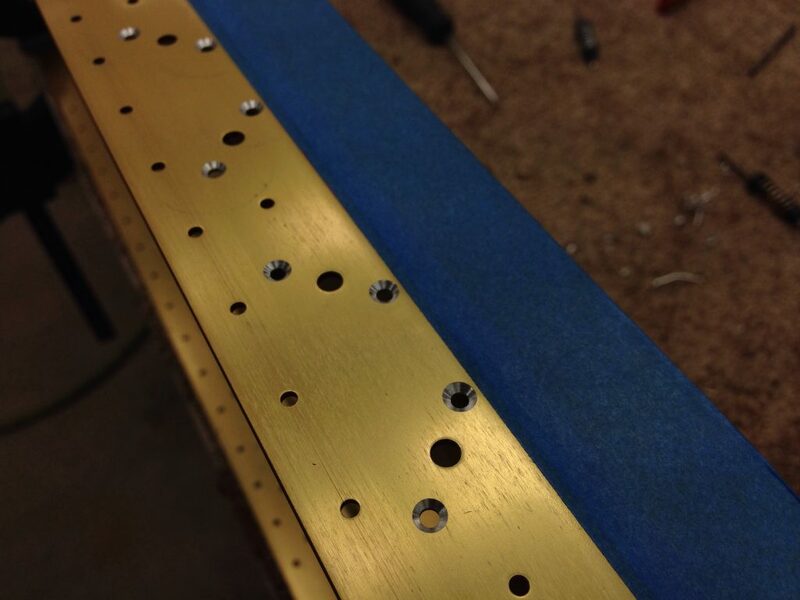 Those rivets need to be flush so the skin lays flat, so they need to be countersunk. First thing I did was run a strip of painters tape over the valley created by the pieces that make up the spar. This is so aluminum shavings don’t get caught there while drilling. So I then started with my #40 reamer and brought all the holes up to final size then countersunk them. These are fairly easy as all I wanted to do was make them deep enough to have the head be flush. I just slowly increased the depth with the micro stop cage until I achieved that goal. Next up are the center holes, the nut plates for the fuel tanks will be a #8 screw and the inspection plates will be a #6 screw. I started with the #8 holes and did about 10 of them before calling it a night. I’m taking my time with these! These holes become fairly large in this process. When they do the pilot will tend to move around as the hole gets bigger and cause “chattering”. This is not good and makes a bad looking countersink. To avoid this I’m using a piece of aluminum that Glen brought. 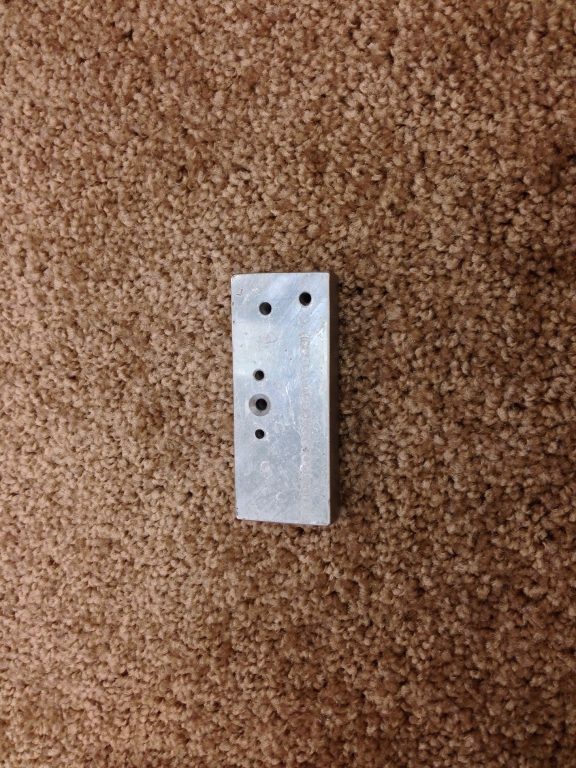 It has three holes drilled into it. Two line up with the rivet holes and the middle is for the pilot of the countersink bit. This keeps the pilot centered as you drill and prevents the chattering. 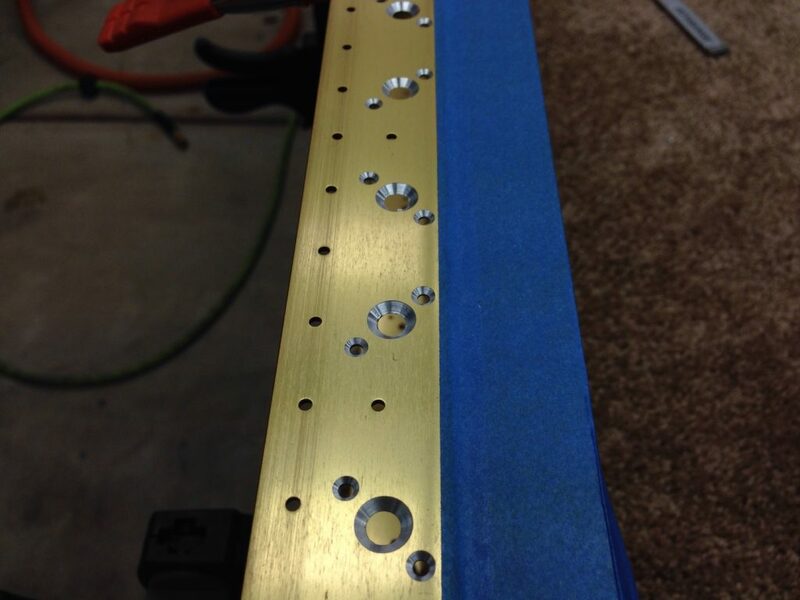 So this is what the #8 nut plates look like when all drilled, there are 60 in each spar for the top and bottom. So now I have all weekend to work and the weather is supposed to be in the middle 70’s and sunny! It’s gonna be a great weekend now that I’m back in the Hangar!